MGB Food Notes: I am now qualified to be a professional soup reviewer. 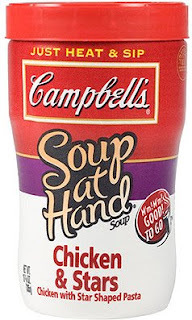 Today's soup review is about Campbell's "Soup at Hand" soup. It comes in various flavors and I am particularly fond of the Chicken and Stars flavor. It is cheap at about $1.20 and 2min in the microwave you have Soup at Hand. The taste is good and fills me up perfectly. I can't eat the cream flavors just yet but I bet they are good too. I would like to suggest they also do Spaghetti at Hand, Chili at Hand and maybe Chicken Pot Pie at Hand too. If they do this I get credit for mentioning it here first. Campbells please feel free to send me coupons or cases of soup. For breakfast I changed things up a bit and had a scrambled egg. Notice i did not say scrambled EGGS (plural). The egg was good and went down very well. I topped it off with a new creation that my friend Jim gave me for taking in the necessary Whey protein. He mixes vanilla whey protein with sugar free vanilla pudding and then puts it in the fridge to make it real cold. It tastes like cake batter.. yum. Tomorrow I will try yogurt instead of pudding mix and add the citricel fiber stuff i need to take. It might just taste like a dreamsickle..
ok. that's it for the MGB Food Channel until next time..